Bicycle Nouveau Playing Cards was the first playing card project by Bona Fide Playing Cards on Kickstarter. 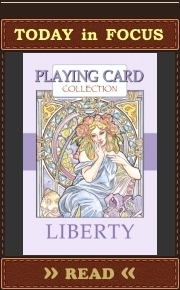 They decided to print it with the United States Playing Card Company (USPCC). Unfortunately, people misappreciated this interesting deck, and it wasn’t funded. 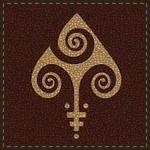 Bona Fide Playing Cards has taken into account some organizational and financial peculiarities of the Kickstarter playing card campaigns and restarted it… luckily without detriment to art and meaning content of this nice deck (only Eleanor of Aquitaine substituted Celtic Queen, Boudica – the Queen of Clubs). 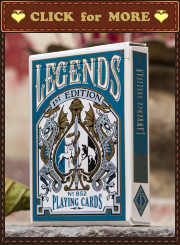 The decks are planned to be printed by the Expert Playing Card Company (EPCC). Can you copy, reproduce or imitate something? Can you create something absolutely new? How do you think what is harder to do? I think it’s harder to create something new based on something traditional. It is even harder than to create something absolutely new from scratch. You aren’t fully free in your creative process. You have to take into account well-known standards and characteristic features of something. In case of essential similarity, you will be accused of simple reproduction or imitation of a specific subject, art style, etc. In case of the complete absence of above mentioned recognizable elements in a created subject, you will be accused of disrespect for traditions. You have to find some effective balance. It isn’t easy. As it was said, Bona Fide Playing Cards tried to take into account old traditions of French playing cards and combine them with Art Nouveau style. These aren’t first playing cards generally devoted to Art Nouveau. But, creating the playing cards, Bona Fide Playing Cards also tried to rethink different existent works of art. The final task was to create on such basis something new with modern twist, but preserving recognizable elements. And I think their attempt is really nice and quite successful. The main difference between the editions wil be: 1) different tuck cases: 2) different back designs: 3) different colours of backgrounds for faces of the playing cards; 4) different design elements in the backgrounds of the faces (see pictures below). This project could be funded if at least $15,000 was pledged by Thu, Apr 30 2015. Modern court cards of so-called Anglo-French (Anglo-American) playing cards as we know them today are inspired by the 16th century designs produced in Rouen. This is a city on the River Seine in the north of France. It was one of the largest and most prosperous cities of medieval Europe. Quite often prosperity stimulates interests in gambling. Playing cards happened to be a nice instrument for such entertainment. Printing of playing cards was very expensive that days and only prosperous cities can have appropriate manufacturers. That could cause wide popularity of playing cards produced in Rouen among other cities of France and even Europe. It was, as a rule, cheaper to buy a deck than to produce it. Playing card printing became so profitable that playing card manufacturers from Rouen began exporting decks to England around 1480. Rouen pattern became the standard design for England in 16th century. But English entrepreneurs tried their own effort in this field… century later :). English playing card manufacturers produced lower quality cards than their continental counterparts leading to the loss of detail from the Rouen pattern. Modern Anglo-American pattern is the result of Charles Goodall and Son’s (a famous English playing card manufacturer) reworking of the old Rouen pattern during the 19th century. It also became common for US. On the other hand, playing card manufacturing wasn’t concentrated only in Rouen. They made their own modifications of card patterns. So, there were a lot of regional patterns. For example, Paris had its own card printers. They happened to be quite successful. While Rouen pattern remained popular for England, the Parisian pattern came to dominate in France around 1780 and became known as the portrait officiel. Both the Parisian and Rouen court cards were named after historical and mythological heroes and heroines. But the Parisian names have become more common in use. They became more common even for cards of Rouen design. That’s why, speaking about modern English / American standard patterns of playing cards, we use such names as Anglo-French or Anglo-American playing cards. Bona Fide Playing Cards followed traditions of the Anglo-French pattern, as well as traditions of playing card heroes and heroines… with the exception of the Queen of Clubs (Argine in accordance with Parisian names). The King of Spades represents the biblical King David. In the picture: Statue of King David by Nicolas Cordier in the Borghese Chapel of the Basilica di Santa Maria Maggiore (Rome). According to the Bible, David was the second king of the United Kingdom of Israel and Judah. He also pointed as an ancestor of Jesus in the New Testament Gospels of Matthew and Luke. His life is conventionally dated to c. 1040–970 BC, his reign over Judah c. 1010–1002 BC, and his reign over the United Kingdoms of Israel c. 1002–970 BC. David is depicted as a righteous king, an acclaimed warrior, musician, and poet. He is an important figure to members of the Jewish, Christian, and Islamic faiths. The Queen of Spades represents a Greek goddess, Pallas Athena. Athena is goodness in ancient Greek religion and mythology. She traditionally represents: wisdom, courage, inspiration, civilization, law and justice, strategic war, mathematics, strength, strategy, the arts, crafts, and skill. The Jack of Spades represents the legendary character Ogier the Dane. Ogier the Dane is a legendary character who appears in Old French chansons de geste (Old French for “songs of heroic deeds”). Chansons de geste were a type of epic poems that appear at the dawn of French literature. Ogier first appears as one of Charlemagne’s knights, in Chanson de Roland (written ca. 1060 AD). He wasn’t referenced to any known historical figure. The poem Chevalerie d’Ogier de Danemarche (written ca. 1200-15 AD) made him increasingly popular hero in European literature. It describes Ogier as the son of the Danish king Geoffrey (ruled from 804 or earlier until 810), who is the enemy of Charlemagne, given as a hostage to Charlemagne. I am enjoying your blog. Love playing cards with ‘playing’ as both a verb and adjective. Am a backer of the Nouveau deck.